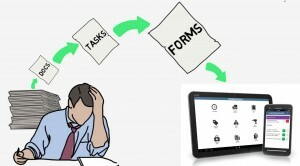 Go Mobile Forms – Results Matter Inc.
Go Mobile Forms delivers a mobile workflow platform to transform how you collect, display, and report information for your mobile team. You can reduce the risk of human error by ensuring your team follows your processes that are built into the forms. Our native app enables your business to be more effective by giving your team a familiar way to record, validate, and send information while on the go. As part of the Results Matter group of companies, we do more than just provide a mobile app. We work with you to make real improvements in your business, support your strategy, and implement a solution that meets your existing business systems and processing needs. A good idea, implemented correctly, can produce great results. We have worked with sole practitioners and governments to implement solutions that meet your deadlines and needs. To find out more visit our website, http://GoMobileForms.com or contact us at 403-800-8595.